Far-right fringe candidate Jair Bolsonaro nearly won Brazil’s presidential election this weekend. He will face leftist Workers Party candidate Fernando Haddad in a runoff later this month. Brazil’s currency, the real, rallied in early trading Monday. 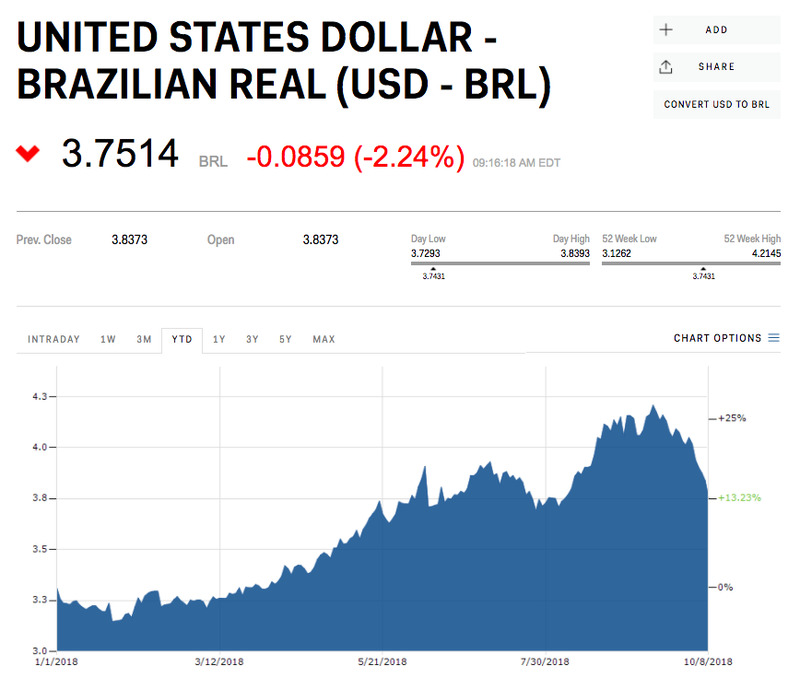 Brazil’s currency jumped Monday following presidential elections over the weekend, where far-right fringe candidate Jair Bolsonaro easily secured a spot in a runoff scheduled for later this month. The real was up as much as 4% to 3.75 per US dollar in early trading, hours after final election results came in. Just missing the half-vote threshold needed to win altogether, Bolsonaro secured 46% while his closest rival Fernando Haddad, of the leftist Workers Party, had 29%. The two will vie for the presidency October 28. Having praised Brazil’s military dictatorship in the past, some fear Bolsonaro poses threats to democracy in the country. But the populist has found some support through promises to aggressively address crime rates and the still-ailing economy. “While very conservative in certain issues, he is expected to be pro-business,” Citigroup analysts wrote in a recent research note. Bolsonaro has said he would consider privatizing institutions in the country, backed pension reform, and advocated for an independent central bank. Meanwhile, Haddad supports scrapping a government spending cap and strengthening public banks and companies. With highly-fragmented legislative bodies, however, he could face an uphill battle putting those reforms in motion. William Jackson, chief emerging markets economist at Capital Economics, said the Bolsonaro boost may start to falter once these obstacles become more apparent. Read more about what the presidential race could mean for Brazil’s economy.